It's been a while since I've written a favourites post but as I've been loving so many products in July, I thought it was a great opportunity to write one. In fact, I think I will go back to doing monthly favourites posts as they are some of my favourite posts to read so I'm hoping you will like reading mine. 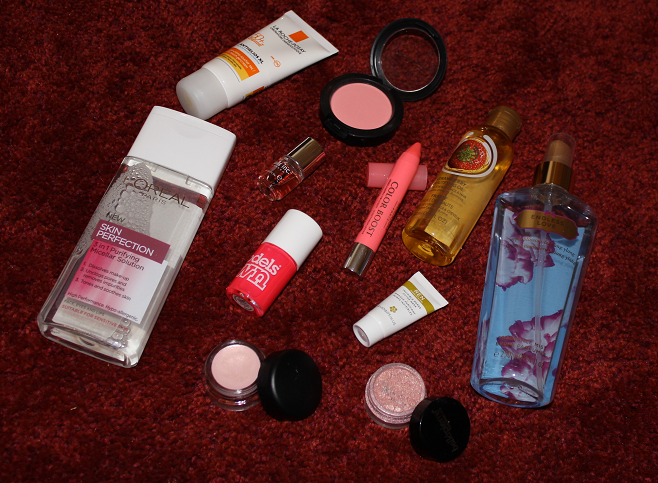 A real theme in my makeup this month has been peachy-pink as I think it looks great for the Summer. 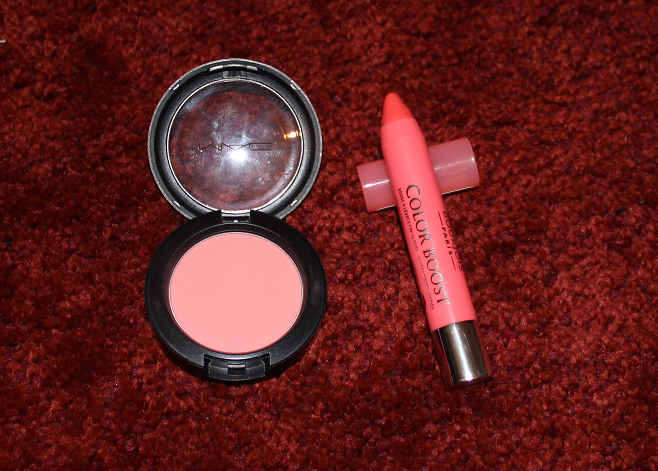 My favourites from this category are both new purchases that I've been enjoying using. First up is the MAC Blush in Royal Sunset from their All About Orange collection in June 2013. I generally buy shimmery blushes so I was quite pleased to add this matte one to my collection. I love the colour of this too, it goes so well on my pale skin. MAC normally repromote their limited edition products so hopefully if you like this, it will available again soon in another collection! The Bourjois Color Boost in Peach on the Beach is a crayon style lip product I'd been lusting after for around a month before I caved in and bought it! This is a super glossy, pigmented lip balm/stick hybrid, similar to the Revlon Just Bitten Kissable Balm Stains. I think this is my favourite shade and formula of all the lip crayons I've tried. The Bourjois Color Boost range is quite limited compared to other similar products with only 4 different shades but I like each one of them and would be tempted to pick some more up! 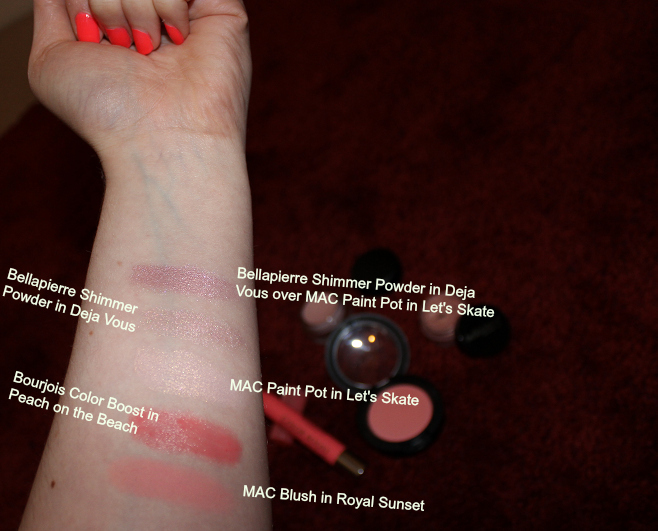 Other makeup I've been loving this month includes the MAC Paint Pot in Let's Skate. This is my very first Paint Pot actually and I can't believe I haven't bought any before now. I'm certainly in the market for some more shades! Let's Skate is a pale, pearlescent, long wearing cream eye shadow with flecks of gold and pink shimmer in it. I absolutely love this colour and could sit looking at swatches of it on my hand all day long. On the eyes, the colour payoff isn't quite as good and it can look a little patchy. 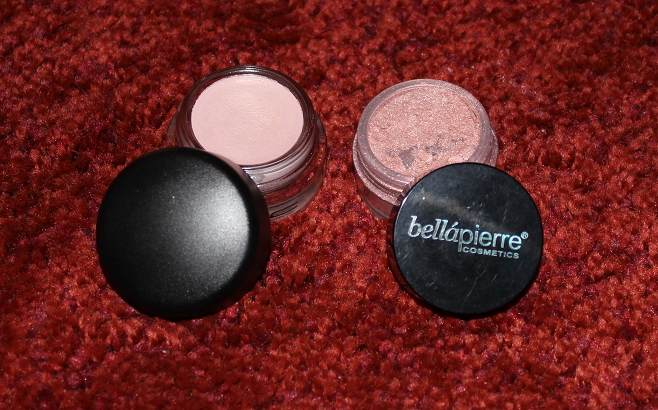 I was quite disappointed with this but then I remembered that most people use Paint Pots like a base for other eyeshadows so I decided to add another of my favourites - the Bellapierre Shimmer Pot in Deja Vu, a lovely shimmery peach loose eyeshadow over the top of it and the result is stunning. It creates a beautiful sparkling soft pink shade that looks amazing in every light and lasts all night! I'm totally loving this combination and have rocked it on two nights out this month. I've swatched all of the makeup mentioned in this post below, including the fab combination just mentioned so you can see the pretty shades properly. I've neglected my Models Owl nail polishes for a while in favour of my recent Essie and Barry M Gelly additions but when I was looking for the perfect match to go with a bright coral dress I bought from River Island, Models Own Pink Punch was the obvious choice after a little swatching session. This is a stunning neon pink with hints of orange and it looked fab on my nails. I'm so glad I've rediscovered this polish so I can get plenty wear out of it during the Summer. Something I've been into this month is wearing a top coat nail polish. I've never bought any of these myself but I received a generous sample of the Nails Inc Caviar Top Coat and I've been using that to make my nail polishes last longer. I didn't even realise this would help my nail polish dry faster and the glossy finish is amazing. It's also great for making your nail polish rock hard which is fab since I always end up with smudges and fingerprints in my polish if I've added more than one layer of colour! The La Roche-Posay Dry Touch Gel-Cream 50+ SPF was my first ever purchase from this brand and I'm highly impressed with it. It is such a great sun protection cream for the face. It doesn't leave my skin looking or feeling greasy and it doesn't clog up my pores either. I've never had any sunburn whilst wearing this product and I burn easily! I would love to try more products from La Roche-Posay now. 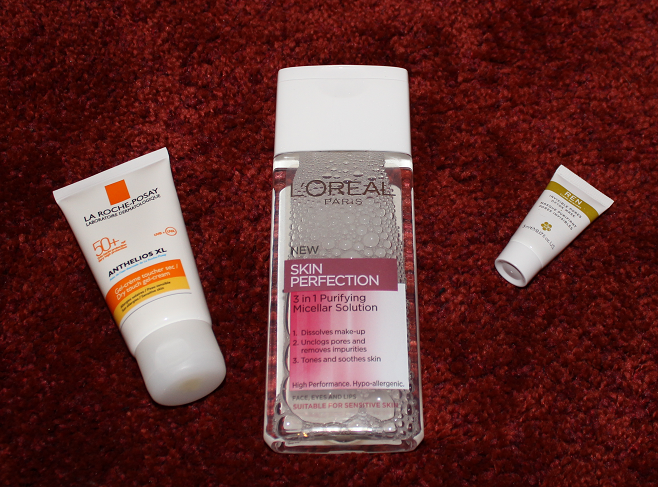 I mentioned the L'Oreal Skin Perfection 3 in 1 Purifying Micellar Solution in yesterday's empties post but just to reiterate, I find this much better than Bioderma, which was a let down for me. This removes my eye make up really well and I just love it! It's replaced my usual No7 Eye Makeup Remover. I tried a sample of the REN Invisible Pores Detox Mask this month and it's a mask I'd been wanting to try for ages. I managed to get 2 masks worth out of this 5ml tube and I was amazed with the results. I have a few large open pores on my face and this actually closed them up and left them invisible! It really does work! I'm definitely tempted to buy the full size of this. I just wish I didn't need to save for things at the moment! 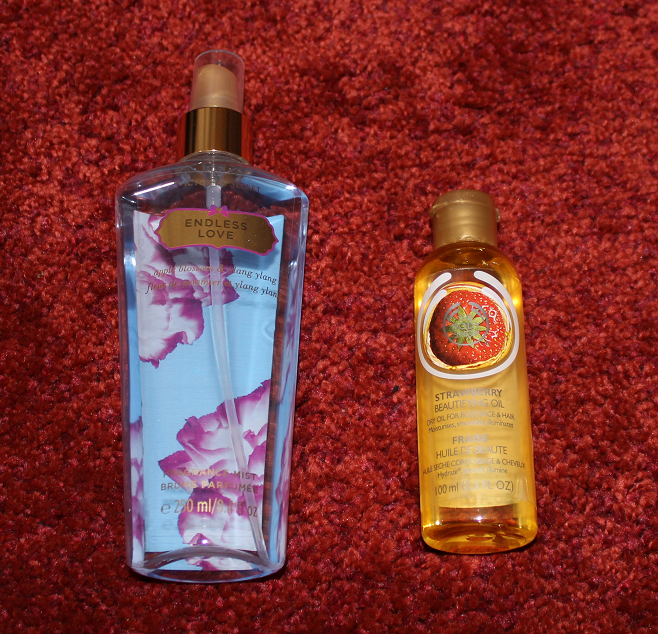 The Body Shop Strawberry Beautifying Oil has been a great product since I've been getting my legs out for a change! It's a lightweight dry oil that I've been rubbing on my legs to add lots of moisture and create a nice sheen to the skin. This fragrance smells so good and the bottle is lasting me ages since you don't need to use much at a time. Right, that's it - I'm getting that Ren mask! I've had my eye on it for ages anyway, but this has convinced me. Also really want to get Peach on the Beach - I think Kate from Gh0stparties was wearing it in her latest video and it looked so beautiful on! I love endless love too! I bought it in Vegas and can't stop spraying it. Victorias Secret are rolling stores out across the UK in October, so hopefully they'll have some good deals!